To make Christmas the most joyful time of the year phpFoxer team prepared special discounts for one of your beloved products. Use promo code "phpFoxer2017" to get 10 % discount on our iOS / Android mobile apps for phpFox. In 2016 our company released 14+ applications, 7+ phpFox templates and a language pack. We also presented 4 different bulk product packages. For the next year we are planning to do even more with your help and we are always open to create next big things that your communities need. Thank you for being with us in 2016 and looking forward to work with you again in 2017! 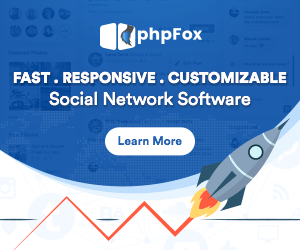 Long awaited phpFox Neutron 4.5 is now available to download. If you still doubt test phpFox Neutron 4.5 version on our demo. Also if you have any questions please contact us by email anytime: office@phpfoxer.com. Thank you for using phpFox. Thanksgiving is a time for sharing and spreading the happiness amongst those who are just very close to you. Send warm thanksgiving poems to all those who are special to you. Congratulations on your professional holiday and wish you more kilometers of code, wage increases exponentially and inexhaustible reserves of hot coffee on the workplace! We appreciate your professionalism, and we want to admit that without you we seem to zero without one in binary code!